I am so happy you are enjoying the THROW BACK Thursday posts! Make sure to leave me a comment if you get sick of them, or if you’d like more! 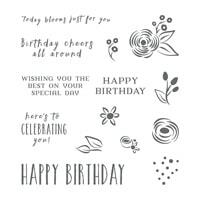 Today I am throwing it back to the Perennial Birthday stamp set. This set is still available, but a few of the colors I used are not. No biggie, just change the colors! Guess what–I found some SIP CARDS!!! (stamps, ink & paper). I have been trying to share a lot of SIP cards lately, and realized I have shared some before without even calling them that! I LOVE the sizes of these cards!!! Make sure to hop on over to the old blog post for all the details and supplies. This is a great stamp set for some quick and easy birthday cards! CLICK HERE to go to original post with all the card details! I found another I made while ago. Gosh, I really like these. I might have to pull this stamp set out again really soon! Way back when I originally shared this stamp set, I did an online class that you could purchase….. Since I am using this as a THROW BACK post, if you are reading this post I am sharing the tutorial for FREE with you. CLICK HERE TO DOWNLOAD THE FREE TUTORIAL! Want to Purchase This Stamp Set? Products? The Perennial Birthday stamp set is still available. If you’d like to order it, simply click the picture below to go directly to the online store and place your order. Looking for some fun stamping tips? ….check out this Pinterest board of mine! Stay up to date on all my free card kits, tutorials, special offers and Stampin’ Up! information when you sign up for my weekly email newsletter. IMPORTANT: after signing up, you will receive an email to confirm your subscription–make sure to CLICK ON IT to receive some fun free card making tutorials. Thank you so much for the tutorial on the Perennial stamp set! I recently purchased this set, but have not had a chance to use it. I love your card ideas. The colors are beautiful also! I’m anxious to get started making card with it. You’ll have so much fun with this set Pam! Happy Stamping!! I really like seeing some of the older stamp sets used. I have a lot of them and sometimes I forget how versatile they are. Thank you for helping to remind me and also for giving me some new ideas for the sets. I love hearing that you’ve got some new ideas to use Bonnie! Happy Stamping!! I’m thrilled to hear that you like these throwback Thursday’s!